2019 will see the internationally acclaimed FIRST® Tech Challenge being run in the UAE for the first time ever, with American University of Sharjah (AUS) hosting the two-day event. The Challenge, which began in the United States in 1992, is a skill-building program for children in grades seven to twelve and will take place over two days inMarch, with applications to close soon. Teams of high school students interested in taking part are therefore encouraged to get their applications in as soon as possible, to avoid disappointment. The Challenge is one in a progression of four programs, which make up FIRST®, an international organization designed to foster 21st century life skills, and spark the interest of young people in STEM subjects: science, technology, engineering and mathematics. The other programs in the FIRST® series include the Lego League and Lego League Junior, along with the FIRST® Robotics Competition where each year, over 400,000 students from around the world participate in the various programs. The UAE Ministry of Education and ATLAB are the two partners of UAE’s FIRST® events. 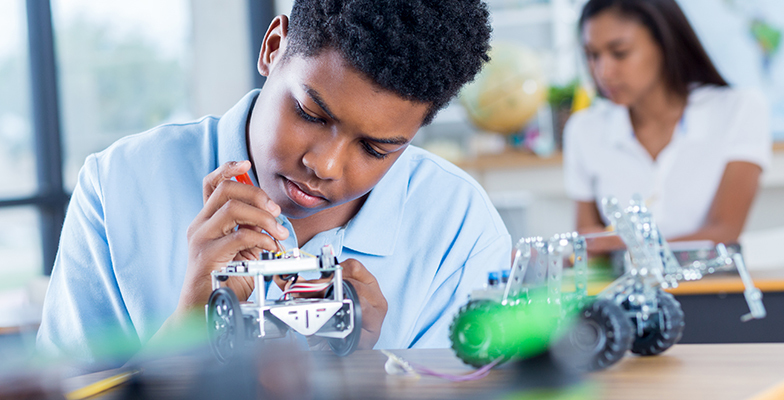 ATLAB and its wide range of STEM educational solutions feature robotics-based learning and hands-on activities, introducing subject models to students in innovative lessons and familiarizing them with both current and upcoming technological concepts. Students learn to collaborate, tackle problems in an inventive manner, and develop skills and leadership qualities that will help them thrive in the future. High school students from across the UAE are invited to register in teams for the FIRST® Tech Challenge. Those who take part will design, build, program and operate a robot, which will then compete against other robots in a floor game. Each year, the challenge has a different theme, with 2019 set for a space theme. Participants will be tasked with creating planet-exploring robots, which will compete in a game called ROVER RUCKUSSM. To get involved as a team or mentor, or to find out more about the FIRST® Tech Challenge, please visit: http://ftcuae.org/.